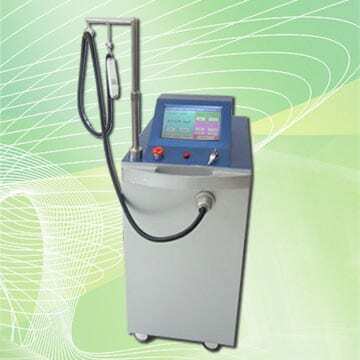 The Nd: Yag laser hair removal system effectively removes unwanted hair on various parts of the body, with the additional feature of being able to do the hair removal even on tanned or darkened skin. Nd: Yag (Neodymium: Yttrium Aluminum Garnet) laser hair removal has a longer wavelength compared to other laser hair removal options; longer wavelengths translate to less pressure being absorbed by the skin than with other laser hair removal methods. The Nd: Yag laser hair removal system can effectively reduce unwanted hair on most skin types, including darker skin tones or tanned skin; this hair removal or hair reduction method may actually be the best option for people who have darkly pigmented skin. The Nd:Yag laser hair removal method can successfully treat larger body areas in a shorter period of time, and is known to cause very minor damage to the skin surface. The Nd: Yag laser method of hair removal can work on majority of skin types – including those that are darkly/heavily pigmented, or even tanned skin. Most of the laser hair removal systems are not recommended or are effective in the hair removal of tanned or dark skin; Nd: Yag is believed to be the best hair removal solution for dark skin. Larger areas that have unwanted hair can be treated more quickly using the Nd: Yag laser hair removal method. This means that the patient will have to spend less time in the doctor’s office to have unwanted hair removed – and more time to go about his or her normal/daily tasks. Studies show that the Nd: Yag laser hair removal system results to significantly longer delay between the period of hair re-growth, compared to other laser hair removal methods or systems that are currently being used. The Nd: Yag laser hair removal system may be less effective on light skin types, and is geared more towards individuals who have darker skin types; this means that those with lighter skin types are recommended to look for other laser hair removal alternatives to ensure effective hair removal or reduction. The quicker repetition rates that are used with the Nd: Yag laser hair removal treatment often results to increased pain or discomfort during the hair removal/reduction procedure. The pain or discomfort that can be felt with the Nd: Yag laser hair removal is definitely greater compared to the other laser hair removal options. Bleaching may need to be done first before undergoing an Nd: Yag laser hair removal treatment for individuals who have darker skin tones. In cases when the carbon used in this particular laser hair removal explodes on the skin, tattoo-like formations may develop after the entire procedure.